I try not to over-think surveys like these, but I find that they give me food for thought: both during and after answering the question. Highly recommended for personal reflection. For example, in the justice survey, I discovered just how much I value contributions to society, in general, as a measure of a person’s social status and “worth.” When I was much younger, I was firmly in the “meritocracy” camp. That’s evaporated over time as I have come to understand how much “skill” can be outside of an individual’s control. We can, however, chose to do things that make the world around us a better place rather than chose things that are self-aggrandizing. That choice, plus effort, seems to me to be a function of agency. I think of this as the “royal version” of “do under others” Golden Rule. 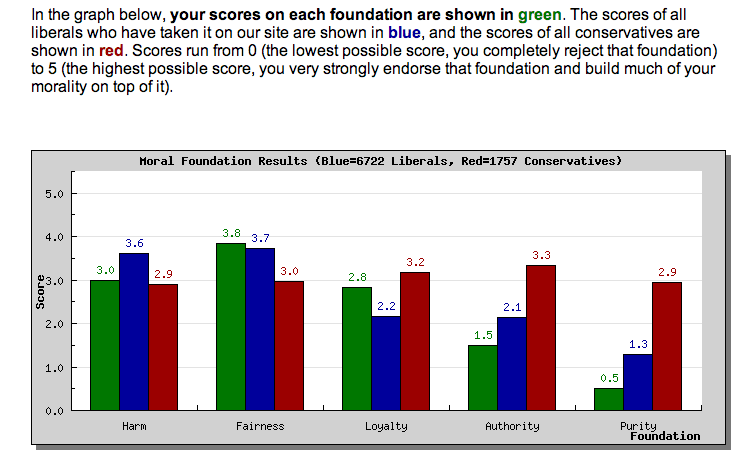 The graph below shows the degree to which you endorse each distributive justice principle measured by this scale (in green) compared to the degree to which the average Liberal (in blue) visitor to this website endorses each principle and the degree to which the average Conservative (in red) visitor to this website endorses each principle. 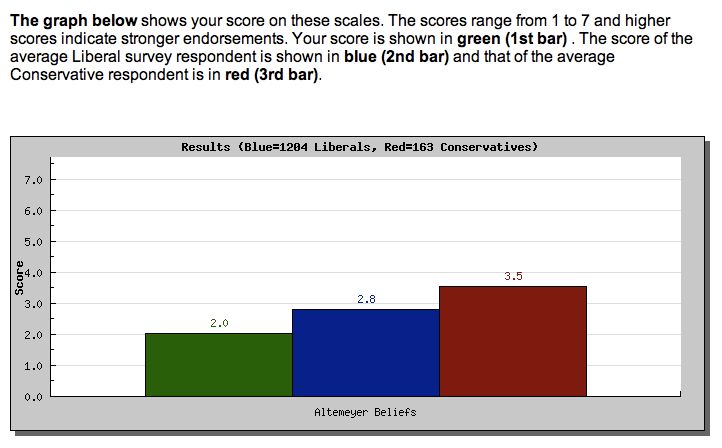 The scale runs from 1 (Extremely Unjust) to 7 (Extremely Just). For a bit more general information on the psychology of distributive justice, we encourage you to read about this interesting project. And for more information on distributive justice in general, feel free to read this very short primer . Why do you care about some virtues and issues more than others? These charts are based upon this article & survey from University of Virginia professor Jonathan Haidt. What are your attitudes toward truth and certainty? This chart is based upon this survey from Bob Altemeyer.